There are many vested interests maintaining a deathgrip on the “standard of care”: pharmaceutical companies that manufacture chemotherapy drugs, medical equipment companies that manufacture radiation treatment machines, medical schools and residency programs that train oncologists, and hospitals that bill insurance companies for surgeries and chemo and radiation treatments. Surgery to remove a tumor does not change the conditions that allowed the tumor to grow in the first place. Many people who have tumors removed grow new tumors. If you can make major changes in the conditions in your body that allowed cancer to develop, that can prevent recurrence of cancer, but simple removal of a tumor treats the symptom and not the cause. Of the three sanctioned treatments, surgery is the least dangerous, but cutting into a tumor can allow cancer cells to spread throughout the body, so surgery is definitely not safe. Radiation is similar to chemotherapy in that it kills both cancer cells and healthy cells, does nothing to prevent recurrence of cancer, and weakens the immune system. 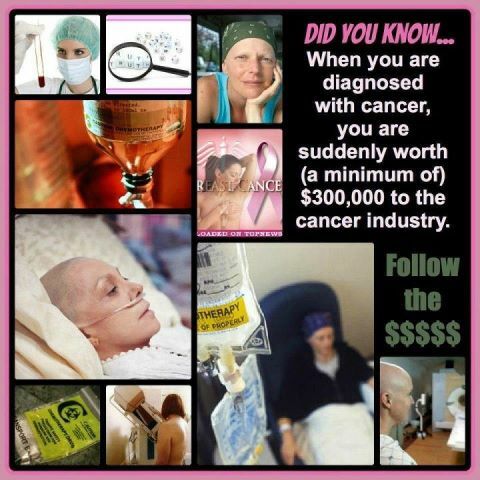 As with chemotherapy, radiation meant to kill cancer cells may also cause cancer. The radiation from ten years of annual mammograms increases a woman’s chance of developing breast cancer by 33 percent, which indicates that all x-rays, including dental x-rays and airport screening machines, should be avoided as much as possible. Dr. Nicholas Gonzalez on Madame Curie’s Discovery of Radiation Treatment Overshadowing Dr. John Beard’s Discovery of Pancreatic Enzyme Therapy. Most cancers don’t respond to radiation. Madame Curie died of radiation exposure. Jim and Donna Navarro, interviewed by Ty Bollinger, tell the story of their son Thomas, focus of the documentary Cut, Poison, Burn, and describe some of the reforms they feel are necessary in the health care industry. Burton Goldberg ~ Biopsies Cause Cancer ~Toxicology studies on surgically removed tumors revealed arsenic, chlordane, DDT, PCBs. Alcohol intake increases incidence of breast cancer by 2 to 3 times. Ralph W. Moss ~ Customized Cancer Treatment: How a Powerful Lab Test Predicts Which Drugs Will Work For You — And Which to Avoid. This is the first book for the layperson on chemosensitivity testing. This is a laboratory procedure by which patients and their doctors can discover which drugs are most likely to work for them and which to avoid. Suzanne Somers interviewed on her book Knockout. Somers tells the story of Farrah Fawcett having chemotherapy without having first had chemosensitivity testing, and then finding from the test that the chemo she was given was not effective for the type of cancer she had. Somers recommends that anyone confronted with the decision to take chemotherapy insist on a chemosensitivity test to determine which of the drugs, if any, will be effective in treating that particular type of cancer in their particular body. The radiation from mammograms can cause DNA mutation. There is new technology available that uses a heat sensitive camera to image physiological activity. This technology results in color photos which show areas of inflammation, over-active organs, or fast-growing tumor activity as red on a scale from red to blue through the color spectrum. Some doctors have complained that clinical thermography gives too many false positives. Think about it this way: If a thermogram shows a tiny heat spot in the breast tissue, and a mammogram shows nothing in that area, what you are seeing is an indication that if you don’t bring your physiology back into balance, you might eventually develop cancer in that spot. So rather than consider it as a false positive, it is more accurate to see it as an early-warning alert that you have a pre-cancerous condition, and need to make some changes. An abnormal Thermogram is ten times more significant As a Future Risk Indicator For Breast Cancer Than a First Order Family History of the Disease. Breast thermography has an average sensitivity and specificity (accuracy) of 90%. In women under the age of 50…MRIs and PET scans cannot come close to matching the combined sensitivity and specificity (accuracy) of breast thermography. Young women with dense breast tissue are the most difficult to evaluate using breast palpation, mammography, and ultrasound examinations, yet their significantly higher risk of developing breast cancer can be accurately detected with breast thermography. Because of its low cost and high degree of sensitivity and accuracy, all women who want to be screened for breast cancer should begin having breast thermograms beginning at age 25. Because thermograms can detect breast cancer so many years earlier than mammograms, there is still plenty of time to bring the body back into balance via (1) an anti-cancer diet; (2) a concerted effort to eliminate exposure to toxins in your environment (drinking water, body-care products, household cleaning products, indoor air, etc. ), (3) cleansing and detoxing to rid the body of toxins accumulated through a lifetime of unhealthy diet and exposure to environmental toxins, (4) self-healing work focused on resolving emotional traumas that are blocking healthy energy flow, and (5) adoption of other habits of a healthy lifestyle, such as getting enough sunshine, exercise, and sleep. “A German epidemiologist from the Heidelberg/Mannheim Tumor Clinic, Dr Ulrich Abel, has done a comprehensive review and analysis of every major study and clinical trial of chemotherapy ever done. His conclusions should be read by anyone who is about to embark on the Chemo Express. To make sure he had reviewed everything ever published on chemotherapy, Abel sent letters to over 350 medical centers around the world, asking them to send him anything they had published on the subject. 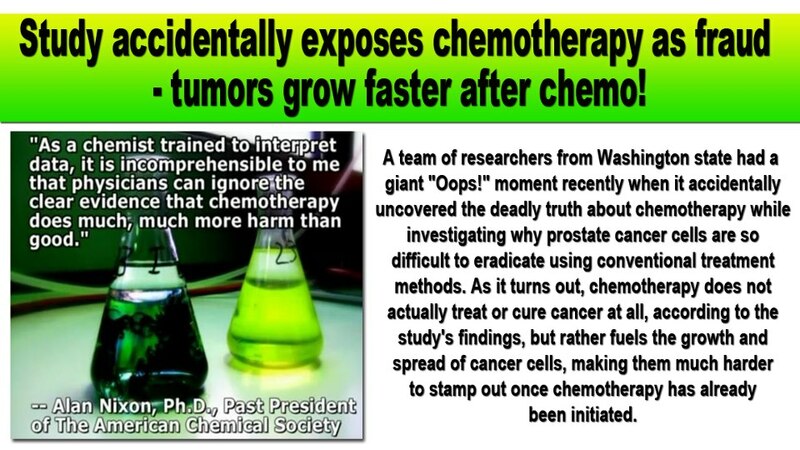 Abel researched thousands of articles: it is unlikely that anyone in the world knows more about chemotherapy than he. “Current approaches to combat cancer rely primarily on the use of chemicals and radiation, which are themselves carcinogenic and may promote recurrences and the development of metastatic disease.” Source: US Patent #5,605,930; “Composition and Methods for Treating and Preventing Pathologies Including Cancer”; Filed 3/7/94; Approved 2/25/97; Dr. Dvorit Samid; The USA Dept. of HHS; p. 56. 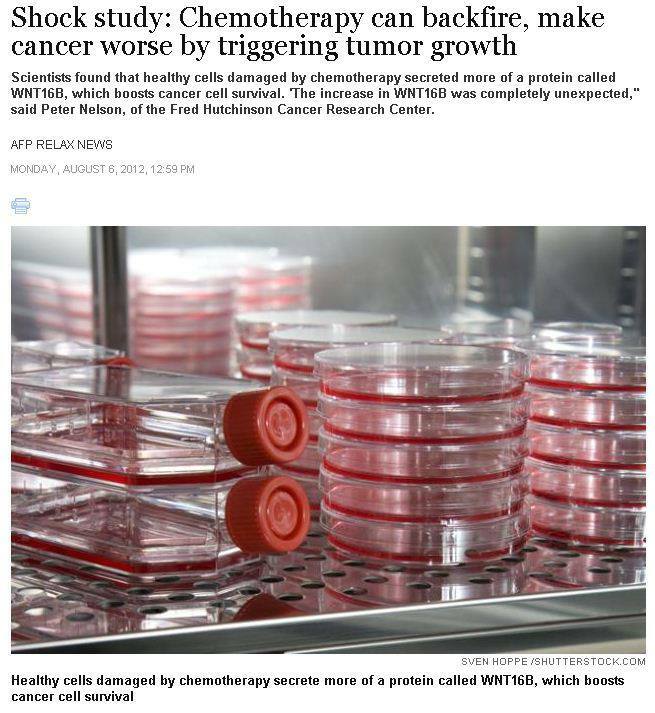 Failure to fund clinical research trials of effective alternative cancer treatments, thus preventing alternative treatments from attaining FDA approval. Preventing alternative cancer treatments from being presented as treatment options by certified oncologists, who must adhere to the “standard of care” or risk losing their licenses. Further, when the NCI does fund and conduct trials, their practice has been to alter the protocols and let the studies fail to discredit the treatment. Li-Chuan Chen, PhD, National Cancer Institute Scientist 1991-1997: “In the past, when the NCI or its assigned entity is conducting an alternative cancer therapy [clinical trial], they always alter the protocols and let it fail to discredit the therapy. But this time the pharmacokinetic data shows that they didn’t do it right. And most scientists will not look at it carefully. Because “Popeye is telling you something, and you don’t question him.” (Relative to Phase II clinical trials of Dr. Burzynski’s anti-neoplaston treatment in which the medication was so diluted that there was no possibility of a beneficial effect.